Some tech battles you tackle head on, some you don’t, and some you leave alone for another day. And some tech riddles are clearly above your tech-grade. It’s like entering the sacred kingdom of the true tech geek without a membership card. And I don’t have one of those. Often, I can get it work, but I’m not really sure how I did it. Is There Time to Figure out the BabyCam and Have a Baby? Two and a half years ago, I was running about the house, prepping for the stork’s arrival. What technologies did I need?! “You should buy a baby monitor,” some of our friends cried out. So I did some research and found a perfectly adequate Graco audio monitor with two receivers. My first new parental tech “Aha Moment” was when I realized that one receiver wouldn’t cut it. You need two. One to carry around until it runs out of juice and another one fully charged and ready to go when the first one poops out! I bought the two-receiver system and proudly reported that we were baby ready. “Sure… you’ve got to see your baby in his room! Audio can’t tell you the whole story. I clearly had some catching up to do. So I did more research, this time on wireless video/audio baby monitors and came up with the consensus that these devices worked… but just barely. Lots of interference and static like a bad cordless phone. Nobody I knew who owned one really like it. But I had to have one!! Next, I turned to IP baby webcams that transmit their signal via Wi-Fi through your home network. I scoured the web for reviews on which cameras would pair up nicely with my Apple ecosystem. Back in 2010, it seemed most of these cameras were set up to work with PCs and not Macs. Yes, there were some that were designed to play with Apple, but their reviews were mixed. Plus the set-up seemed complicated. The reviews didn’t mention it, but it was clear that having a Geek membership card was highly recommended. Finally, a $200 investment for something that likely wouldn’t work? I had diapers and rattles to stock up on! This was not the time to get adventurous. Then I had a flashback to 2004. Do you remember that distant era which was still mostly devoid of Wi-Fi? Eight years ago, I did a little surgery on my house in the name of web connectivity. Back then, if you wanted to get a computer online, it probably needed a hard-wired Ethernet connection. When the cable guy arrived to install my cable modem, I told him to drill a hole between the two rooms for the CAT 5 network cable. Was that crazy or what? I still shudder at the memory. Not long after that, I bought Apple’s Airport Extreme Base Station and brought Wi-Fi into the house. And of course, the hole now served no purpose. Fast forward back to 2010 and the countdown to Baby Lester. I just didn’t have the energy and the hours to put towards figuring out the Wi-Fi BabyCam equation. And then I remembered the hole. The room with the hole was now the nursery. What if I hard wired a little security camera from the nursery to a small TV in our bedroom? You know… like the tiny camera that pops out of the ceiling at a convenience store and is connected via cable to a little TV at the register? I can sense all of the 1’s and 0’s in your brain convulsing in repulsion at my archaic idea. Did anyone even sell this outdated tech anymore? I ran the cable through the wall with the knowing flair of the cable guy who hooks you up with HBO for the first time. Flicked the switch on the TV. And there it was… the crib. Waiting. Time to move on for the big day. For the past two years, my little video umbilical cord has continued to provide countless hours of fun for my wife and me as we’ve watched our little boy sleeping from across the wall. But the fact remains that I never stretched myself to get an IP webcam solution to work. Heck, I didn’t even try! Deep down, the happy home tech bubble that Barrett built has been quietly concealing this disturbing detail, and the guilt has weighed heavy. For two years, I’ve tried not to think about it. But the skeleton rattles about in the back of my head from time to time. What kind of home tech authority am I if I don’t even try to get a stinkin’ BabyCam to work? I feel like I’m the one who needs to be in diapers. But fate has a way of catching up with you. Guess what? I got a little present from a friend last week. From a guy who’s a father to both a toddler and a baby. And he’s clearly at home with tech. He’s got a bunch of cool gizmos working for him. In fact, he had an extra one he didn’t need. Thought I might have a use for it. 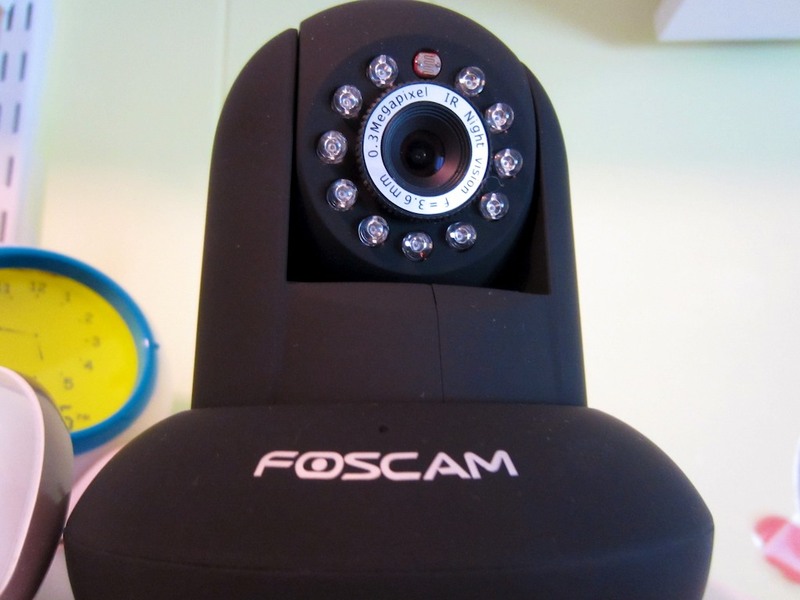 It was a Foscam Wireless IP Camera (model FI8910W). He whipped out his iPhone and showed me how he had programmed the camera’s live signal to beam to the iPhone. Via Wi-Fi or 3G. Like magic. He reholstered the phone and smiled. I thanked him for the generous gift. And my pulse began to rise. Though my stodgy, tethered camera has been doing just fine serving up the Lester Toddler Channel to our bedroom, I knew it was finally time to cut the cord and face my demon. And so I began my trip down the rabbit hole. Because I simply had no idea how to install this Foscam IP camera. So I opened up the instruction manual. Immediately all went black. Confusion surrounded me. There was a small disturbance in the Force as all of the world’s geeks collectively sensed the beginning of my surely futile crusade. I would be facing my Darth Vader, and I simply was not yet ready for the challenge. I would be confronted with confusing acronyms like DDNS and DHCP. I would have to understand the ancient Jedi practice of port forwarding. I would even have to grasp the difference between static and dynamic IP addresses. This journey would surely break my Tech Zen. But I had no choice but to continue on and risk it all. Now that I’ve posted this Part 1, there’s no turning back now!